I make no excuses for my sweet tooth. Given the choice between dessert and just about any other food selection, I'll take dessert every time. That said, I've long been a fan of side dishes that could pass for dessert--ambrosia and strawberry pretzel salad come to mind. 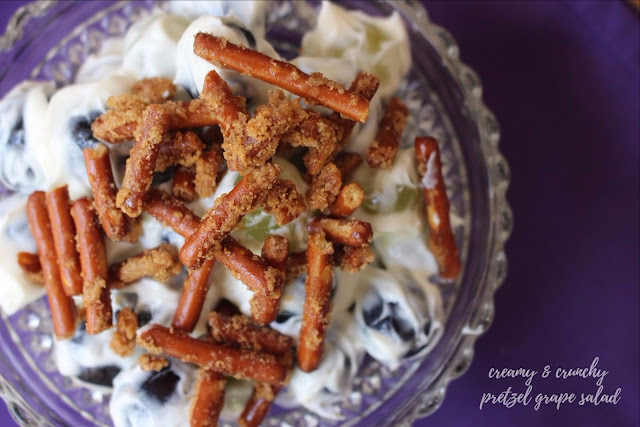 Another dish that fits right into that category is this creamy and crunchy grape and pretzel salad, which is one of my go-to potluck and picnic contributions. The creamy bit comes from sweetened cream cheese, and the source of the crunch is Snyder’s of Hanover® Pretzels which get coated with butter and sugar and baked until they're perfectly crisp and seasoned. The combination of cool and creamy and sweet and salty is amazing and has something for everyone! In addition to fantastic pretzels, you can find Cape Cod® Potato Chips, Kettle Brand® Potato Chips, Late July® variety packs, and Snack Factory® Pretzel Crisps® at your local grocery store. These goodies make summer entertaining as easy as it is fun and offer creative and limitless summer opportunities for snacking with family and friends. Yep, for me, this summer is all about Eva, and snacking while playing with her is a frequent occurrence! *(1) Grand prize: $10,000 cash prize for a family vacation of the winner’s choosing. *(8) Weekly Winners: One weekly winner will win a year’s worth of snacks so they can continue to share the love all year long. 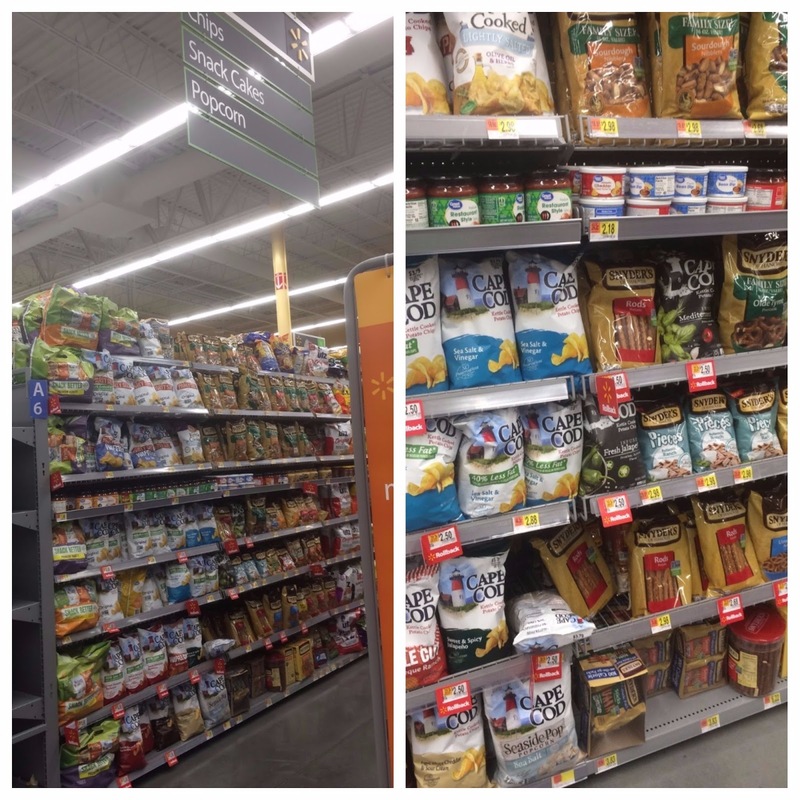 *(57) Daily Winners: Winners will receive a $50 prepaid Visa gift card to stock up on snacks at their favorite retailer. Lazy summer days are the perfect time for snacking and spending time with friends and family. Your guests will never want to leave if you present this grape salad to them! It has it all--sweet, salty, crunchy, creamy, cool, crisp, buttery, and juicy. Fair warning: You might want to double the recipe. Wash and dry the grapes, then set aside. In a large bowl, beat together the cream cheese and sour cream. Add the granulated sugar and vanilla and mix until combined. Mix together the brown sugar, melted butter, and pretzels and spread onto a sheet pan. Bake at 350 degrees F for 15 minutes, stirring occasionally. When the pretzels are browned, remove the pan from the oven and break up the clumps; let cool. To serve, scoop the creamy grapes into a serving bowl and top with the candied pretzels. Creamy, juicy, sweet and crunchy...wow what a party! I'm loving those pretzels on top :). This sounds like the PERFECT summer side! Say hi to Eva for me! You will be amazed at how fast Eva grows. Enjoy every second of snacking with her. Perfect side dish for summer. I love that sweet little baby hand photo, too! Grape salad? I thought this was ice cream! This sounds delicious! Yes, who doesn't like something sweet! I still remember how much I could eat when breastfeeding my youngest. Those were the days! This sounds so tasty, but lets face it. I probably wouldn't be able to get those candied pretzels to the rest of the dessert without eating at least half of them! What a great pic with your hand and little Eva's. I love grape salad and will try your version. Enjoy every second of snacking with Eva! The idea of crunchy pretzels on top of creamy grape salad sounds and looks amazing. I too am all about dishes that are thinly veiled as savoury dishes when they really could be dessert in disguise! This one is a winner with the sweet and salty combination. Love the pic of Eva's little hand, so sweet. Also this dessert looks amazing, the salty sweet combo is one of my favorites, will be trying this one for sure. I have a serious love for pretzels used in sweet recipes. This sounds like a fantastic combination! Enjoy snacking and playing with Eva! I love snacks and I adore your ideas! Excellent post, Grace!